A portrait of Kremlin critic Boris Nemtsov and flowers are pictured at the site where he was killed on February 27, with St. Basil's Cathedral seen in the background, at the Great Moskvoretsky Bridge in central Moscow, March 6, 2015. An officer of Chechnya's Sever battalion has been named the mastermind of the assassination of opposition politician Boris Nemtsov, who was killed in February this year. Investigators say the murder was non-political – a claim that is disputed by Zhanna Nemtsova, the daughter of the former first deputy prime minister. Russia’s Investigative Committee has named the alleged mastermind of the killing of opposition leader and former first deputy prime minister Boris Nemtsov, who was gunned down in the shadow of the Kremlin in Moscow earlier this year. According to investigators, the man behind the murder, which was committed on the Bolshoi Moskvoretsky bridge in the Russian capital late at night on Feb. 27, 2015, is Ruslan Mukhudinov, an officer of Chechnya's Sever battalion [a special force which is part of the Interior Troops of the Russian Federation]. According to investigators, Mukhudinov, who was put on the international wanted list as early as in November this year, is now hiding in the United Arab Emirates. The final charges were brought against a number of defendants, who face life sentences. In addition to Mukhudinov, the defendants in the case feature six individuals from Chechnya and Ingushetia. The alleged killer is Zaur Dadayev, the former deputy commander of the Sever battalion. According to investigators, another suspect, Khamzat Bakhayev, was tasked with collecting information on Nemtsov as well as with hiding his accomplices after the crime, while a man named Tamerlan Eskerhanov was indicted with tracing the politician's routes. The case also features brothers Anzor and Shadid Gubashev, but their role has not been revealed. "All of them are suspected of committing a murder for hire as an organized group, as well as of the illegal acquisition, carrying, transportation and possession of firearms," the Investigative Committee said in a statement. Investigators said the suspects’ involvement in the crime was proven by the results of over 70 sophisticated forensic examinations, interviews with witnesses, face-to-face confrontations, and records from surveillance cameras, including those installed at the murder scene. 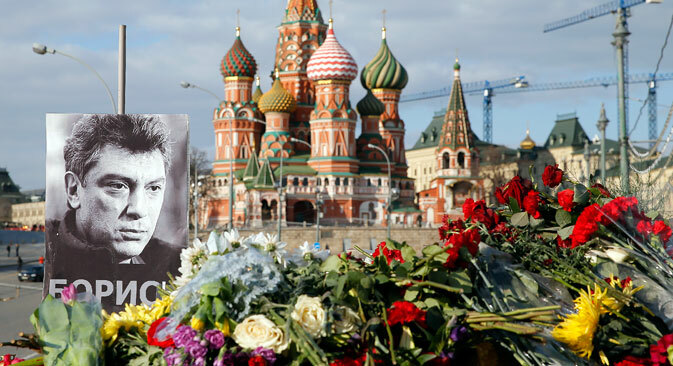 Investigators stated that the killing of Nemtsov was not related to his political or public activities. Earlier, the victim's daughter Zhanna Nemtsova had requested investigators to reclassify the case from a "murder" into an "attempt on the life of a state or public figure," but she was denied. A number of other theories about the identity of those behind Nemtsov’s murder have been put forward, with Nemtsov’s allies alleging the Kremlin had ordered the killing, while some government figures even hinted at Western involvement. The Nemtsov killing is the latest in a succession of high-profile murder cases in Russia in which the identity of the person who ordered the killing has never been established. According to media reports, Ruslan Mukhutdinov was a Moscow driver for the deputy commander of Chechnya's Sever battalion, Ruslan Geremeyev, who also was at one time under suspicion of involvement in the murder of Nemtsov (he is a relative of a Chechen senator and also of a State Duma deputy). The battalion was formed in 2006 from forces controlled by Chechen leader Ramzan Kadyrov, and included people from anti-terrorist centers, which also employed former militants. After 2003, they were won over to Kadyrov's side, which was a way to adapt numerous former militants. The media also describe Sever as Ramzan Kadyrov's personal battalion. Investigators believe that Mukhutdinov is the man nicknamed Rusik who was referred to by Nemtsov's alleged killer Zaur Dadayev in his early testimony. Dadayev alleged at the time that the decision to kill Nemtsov was taken because of his stance on the terrorist attack on the offices of Charlie Hebdo, and a certain Rusik obtained weapons and the car that was used in the murder. However, Vadim Prokhorov, the lawyer of Nemtsov's daughter, has already said that the family does not agree with the claims that Mukhutdinov was the murder's mastermind. According to him, investigators are simply deflecting attention from the real criminal. "I see this statement as nothing but a Christmas present to Ramzan Kadyrov [the head of Chechnya; the lawyer previously requested that Kadyrov and other high-ranking officials be questioned in connection with Nemtsov's murder – RBTH]," he told the Russian media outlet RBK. "Because who is Mukhutdinov? A personal driver and assistant to Ruslan Geremeyev, who cannot have his own motives for Nemtsov's murder."